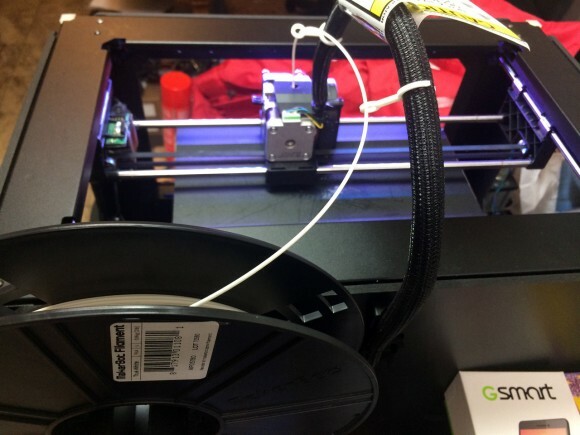 You’re an expert designer and your 3D printer is perfectly configured, but your filament isn’t getting the love and attention it deserves, so the time has come to get that mess under control. That’s why MakerBot is asking you to design a brilliant new filament spool holder – create and upload your design by September 6th at midnight for a chance to win a 10 pack of MakerBot filament. – Design something! You can participate in this Challenge whether you’re a 3D-modeling expert or an absolute beginner. In fact, we especially encourage entries from people that are beginners! – Post your design to Thingiverse. You can modify your design anytime up until the September 7th deadline. – Include the challenge tag. To be considered for this Challenge, your Thing must include the tag #FilamentChallenge. – Design iteratively. Use all of the time available to you. Don’t be afraid to upload new and different versions of your work. – Tell the story of your design. Take time to write a good Description and Instructions for your model on Thingiverse. How did you design your model? What did you have to redesign along the way? What does your model do, and why is it cool? What settings do you recommend for 3D printing your model? – Make it 3D-printable. While owning a 3D printer is not a requirement for entry, printing and documenting printability will go a long way toward winning. – Take good photos to show off your work. Photograph your design from every angle and upload all of your best, most informative pics. – Consider a video. Sometimes a video speaks louder than a photo, especially if your design moves or interacts with things. You can upload a video clip to the Thing page for your model by posting the model to YouTube and then including the link to that video in the Description. The video will then automatically be included in the Gallery for your Thing. 1st prize for the best overall design will receive a 10 pack of MakerBot Filament in PLA or ABS. Four additional designs will receive one year of MakerClub for each of the following: Best Multi-Spool Holder, Best Spool Holder Customizer, Best Novelty Spool Holder, and Best Simple Spool Holder. MakerClub members receive a 10% discount on MakerBot Filament and free shipping for one year. If you remember a while ago we’ve had a weird issue with the filament guide tube on our MakerBot Replicator 2 3D printer. Since then we’ve replaced the teflon filament guide tube with a new one and the device was working normally again, but we also started experimenting with different ideas about optimizing the spool holder position in order to eliminate completely the guide tube as a means to avoid possible issue in the future. The general idea was to develop an overhead spool holder that would attach to the top of the 3D printer and sit on one of the sides of the 3D printer. While working on this idea designing a simple and effective solution we’ve come to another interesting and much easier solution that tends to work surprisingly well in out experience and we’ve decided to share our findings with you to help you get less issues if you are using a Replicator 2. 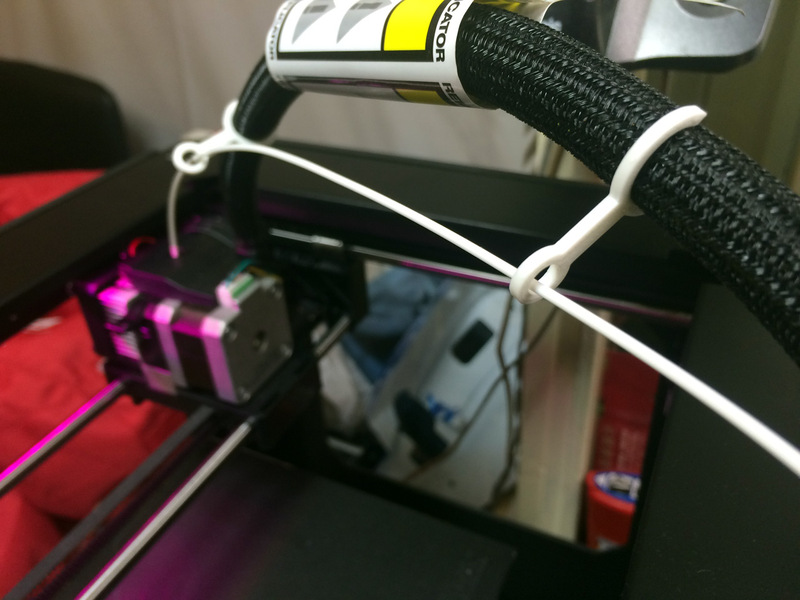 It requires you to reposition the filament spool holder and to print two small parts that will be used to guide the filament to the extruder. All in all you can do this simple modification is no time at all. First you need to remove the filament spool holder from the standard position at the back of the printer. You need to attach it to the back plastic panel of the 3D printer, surprisingly it was a perfect fit and the result is really good as it brings the filament spool at a perfect height that would allow you to avoid using a filament guide tube. 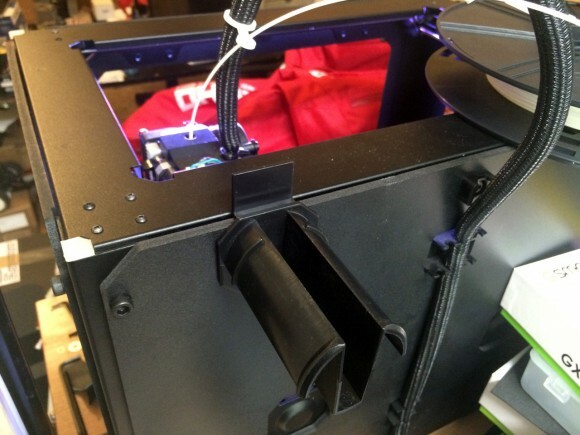 Furthermore you can use two spool holders, one on each side of the back of the printer making it easier to switch the filament as well as making it compatible with the Replicator 2X if you are not using the top cover. This does not require any modification to the printer itself whatsoever and works really well for the moment based on our own experience using the modification. Next you need to print two of these filament guide adapters that we’ve posted on Thingiverse and attach them to the cables that go to the extruder of the printer. They are with a clip on design, so they are easy to attache and not so easy to detach from the sleeved cables and then you just need to pass the filament through the two holes of the printed guides and insert it in the extruder. As we’ve said already it is really easy and works very well. After we’ve done this modification/upgrade to our MakerBot Replicator 2 we’ve seen a decrease of the problems with failed prints associated to filament jams when compared to the standard design with the spool down at the back and using the PTFE guide tube for the filament. If you do try this please report how it works for you and if you are seeing any difference on your end. This modification is originally designed for MakerBot Replicator 2 3D printers, but it will most likely work on other models that are similar in design to the Replicator 2. When you already own a 3D printer you can start buying products that come in two halves – one that is 3D printable and you need to make the parts yourself and another one that is with components that you cannot print. We have purchased the RoboSavvy Universal Spool Holder kit that essentially comes just like we described above as we wanted to have a separate filament spool support that is not directly attached to the 3D printer. 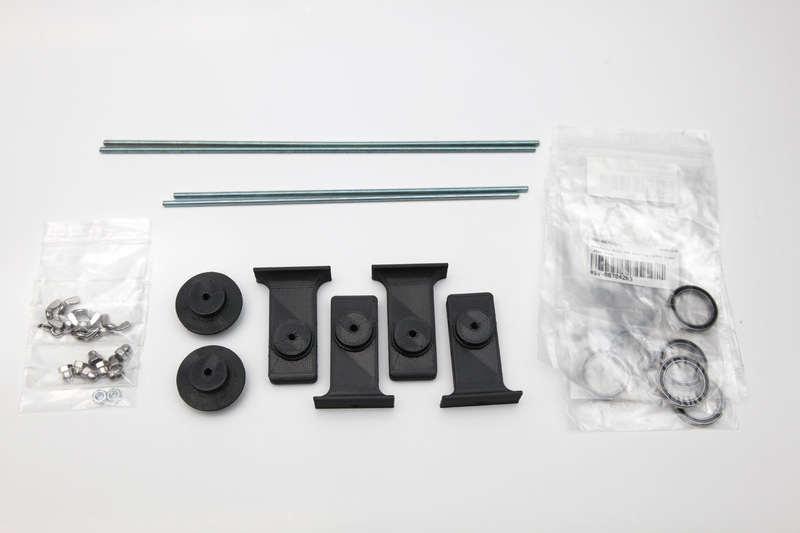 The kit itself comes with all the metal parts that you need in the form of rods, nuts and bearings and the other plastic parts you need to print yourself – the STL files are provided (the parts in black on the photo above we have printed ourselves). The parts you cannot print are actually common items that you might be able to easily find in a hardware store near you, but you need to buy them separately and they are sold as a complete kit, so it is easier to acquire all that you need. The Universal Spool Holder is designed to support two medium sized spools of varying lengths at once, and can be adjusted to support spools up to 21 cm wide, so pretty large ones. On the photo above you can see our fully assembled spool holder with a single MakerBot large 0.9 kg (2lb) spool of PLA material mounted on top of it, this leaves quite a lot of space for more than one more spool even if larger, and even though the spool is small in one end the holder remains stable and works well. It would’ve been nicer if we’ve had another 4 bearings and wing nuts in the kit, so that we could add the option for a third spool, but we can get them additionally anyway, so not much of a problem. 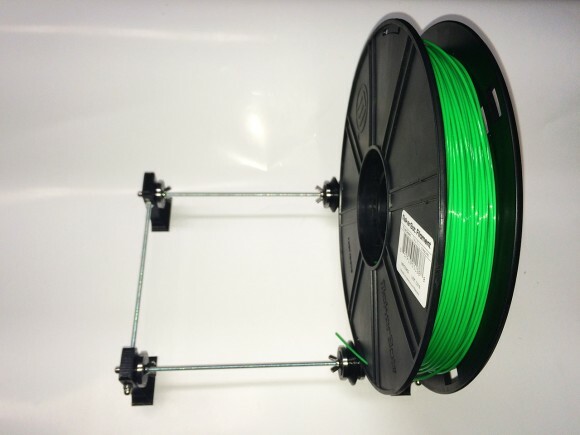 The idea is that the spool holder is designed for medium and large size spools and you are most likely going to be using a lot of smaller size ones as well, so you are most likely going to need to add the option for a third spool to make it more useful anyway. The RoboSavvy Universal Spool Holder is a nice and useful product that we liked very much and the fact that we needed to print some parts and assemble the unit ourselves is a nice addition for people who like us like this kind of stuff. While assembling the spool holder we have found out that there was a pair of hex nuts missing from the package, but we had some spare M4 nuts lying around, so we have quickly fixed that. Now what we only need to do is find some more 20x27x4mm bearings and print two more plastic middle parts on the 3D printer and we’ll have the option to extend the holder to three spools.